How can we use persuasion methods to make people more physically active and improve their sport and exercise experiences? How can instructors, coaches, athletes, and practitioners most effectively communicate their messages to others? 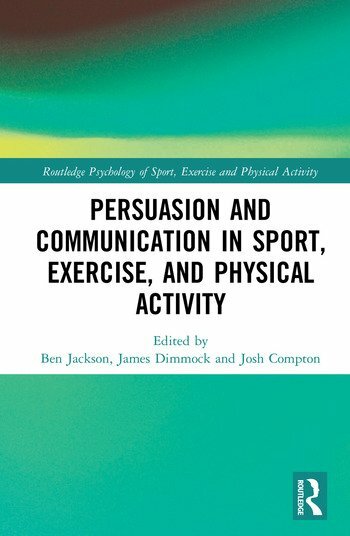 Persuasion and Communication in Sport, Exercise, and Physical Activity is the first book to consider the applications of persuasion frameworks within activity-related contexts, while also summarizing the major developments relating to communication topics in these settings. It provides a state of the art review of the key developments, challenges, and opportunities within the field. It brings together international experts from the fields of social, health, and sport and exercise psychology, to give theoretical overviews, insights into contemporary research themes and practical implications, as well as agendas for future research. Covering topics such as changing attitudes towards exercise, social influence, persuasive leadership and communicating with people with physical disabilities, this book provides a contemporary approach to persuasion and communication in a sport, exercise and physical activity setting. It is an important text for upper-level undergraduate and postgraduate students, as well as academics in the fields of Sport and Exercise Science, Kinesiology, Health and Physical Activity Promotion, and related areas of Psychology. Ben Jackson is a Senior Lecturer in Exercise, Health, and Sport Psychology at The University of Western Australia, Australia. James A Dimmock is a Senior Lecturer in Exercise, Health, and Sport Psychology at The University of Western Australia, Australia. Josh Compton is an Assistant Professor of Speech in the Institute for Writing and Rhetoric at Dartmouth College, USA.